The first timepiece of the collection where exquisite craftsmanship and high horology are celebrated as traditional watchmaking techniques combine with flawless modernity. Complication One pays tribute to time-honored watchmaking tradition and know-how. With its new type of transmission system and way of reading time, this masterpiece breaks the traditional codes of watchmaking to reveal the movement’s intricacies and complexity. Be mesmerized by a unique view of the escapement, an inner heartbeat revealing the dynamics of time. Nestled in an elegant and contemporary case, the very essence of the mechanism is given a prominent place on the dial ensemble. The dynamic, multi-level dial is comprised of sapphire discs that seem to float in space. Hours are displayed at 8 o’clock while minutes and ten-minutes are indicated in an original yet intuitive way at 4 o’clock by two jumping hands, the ten-minutes hand being also a retrograde hand. Positioned at the center stage, the double escapement wheel with inward teeth and the anchor, with their revisited design, offer a striking indication of the time flow. These luxurious creations are each composed of superior quality, hand-finished components and promise to be iconic classics for years to follow: compelling and captivating, complicated yet admirably humble. Emmanuel Bouchet’s story began with a curve. A distinctive design through cutting edge idioms and contours, traditional craftsmanship and technical innovation. The Complication One is endowed with a hand- wound mechanical movement composed of 283 parts exclusively developed for this model and entirely made in Switzerland. The result of thousands of hours of hard expert work, the caliber EB-1963 is of unequalled technicality. In most watches, the regulating organ oscillates between 21,600 to 36,000 alt. per hour, making it impossible for the wearer to observe in detail the inner working of the mechanism. In Complication One, the frequency of 18,000 alt. per hour allows the wearer to contemplate the movement and to understand how time works mechanically in a captivating and unique way. Complication One is composed of double barrels which guarantee a 55-hour power- reserve, indicated on the back of the timepiece. One barrel drives the going train to the escape wheel, regulated by a free-sprung balance on a Breguet type overcoil. The second barrel keeps the transmission escapement on the dial under tension. 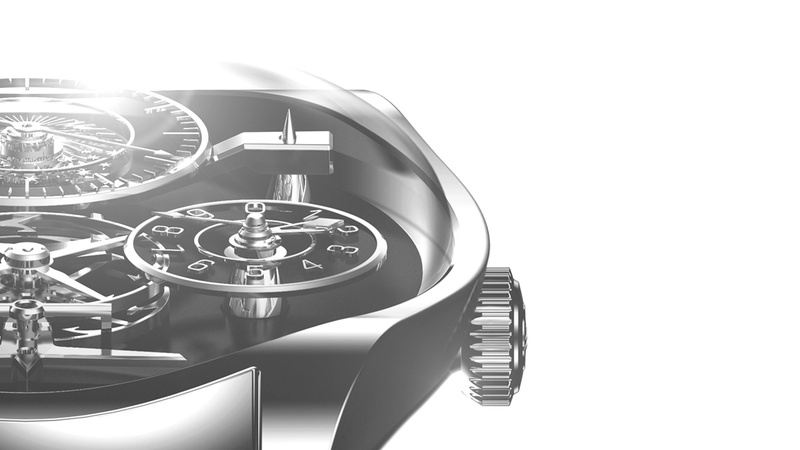 At the back of the piece, the sapphire glass lets the movement shine through. The space split in two symmetric parts sports superb finishes that highlight the movement in every details. The most seasoned eyes will be able to see a distinctive element in action when the timepiece is wounded up. Every detail has been meticulously considered, from mechanical excellence, to design aesthetic and perfect finishes. To emphasize the iconic character of this mesmerizing timepiece, the future owner may combine his personal creativity with Emmanuel Bouchet’s mastery in order to create a Unique Complication One.